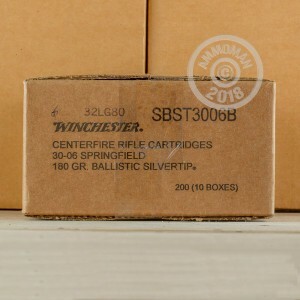 These .30-06 cartridges from Winchester's Ballistic Silvertip series will perform well on anything from boar to deer and elk. 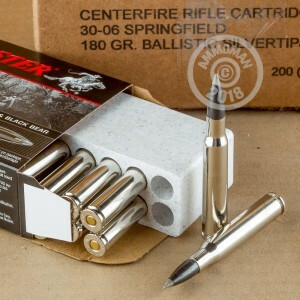 Each cartridge in this box of 20 fires a 180 grain polymer-tipped bullet at a muzzle velocity of 2,750 feet per second. As a .30-06 Springfield cartridge, this round possesses excellent inherent accuracy. However, the advanced design of the Silvertip bullet takes this performance to another level. The Silvertip's polymer tip provides a high level of ballistic efficiency, reducing drag and enhancing long-range performance. It also contributes to the bullet's expansion in the animal by impacting the lead core and tapered jacket and forcing them outward to create the familiar "mushroom" shape that is so effective at knocking down game. This ammo uses non-corrosive Boxer primers and nickel-plated brass cases for smoother cycling. The bullets are coated with a black oxide known as Lubalox for reduced barrel fouling. 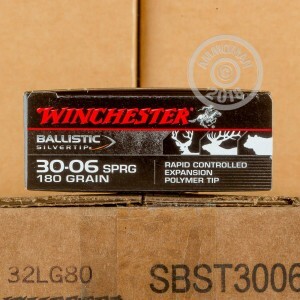 Stock up on ammunition for hunting, target shooting, and self-defense at AmmoMan.com--all orders over $99 ship for free!